← Hickory, North Carolina. May 19th, 2011. A sinkhole developed Saturday evening, closing a section of Schrock Road to traffic. The sinkhole happened on the westbound lane of Schrock Road, east of Kimball Avenue. Black Hawk County Sheriff’s Office personnel blocked Schrock Road from both Hawkeye Road and Kimball Avenue. Road crews were planning to set up barriers to block at those two intersections, as well as fence off the sinkhole. The hole measured about eight feet deep and six feet by five feet across. There were no reports of damaged vehicles or injury. The hole is alongside a bridge over a small creek. Nearby property owners report the section that caved in had recently had an asphalt patch applied. 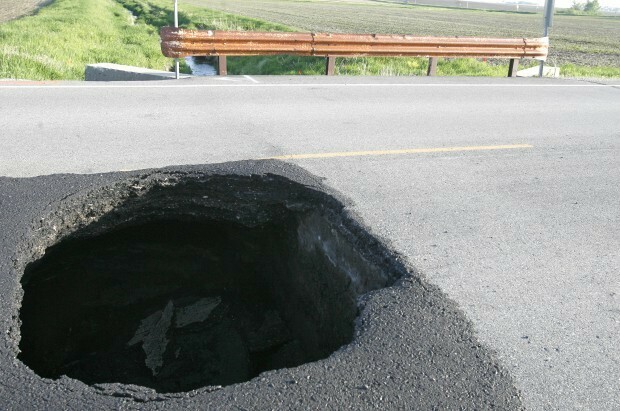 This entry was posted in Pictures and tagged Black Hawk County, Iowa, Schrock Road, sinkhole. Bookmark the permalink.